For more than 20 years, Propeller Brewing Company has been making quality craft beer in Halifax. Brewing good beer takes two important elements—the highest quality, all-natural ingredients and a talented brew master. Propeller Brewing thinks their way of balancing hops and malts and how they choose to brew is much art as it is a science. Handcrafted beer is unique and special. It’s brewed in small batches, with time-honoured methods that produce distinct, full-body tastes and aromas. 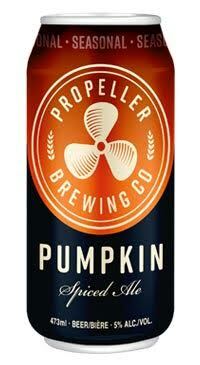 Brewed using Howard Dill’s world famous Atlantic Giant Pumpkins and a special blend of spices. It’s the next best thing to pumpkin pie.